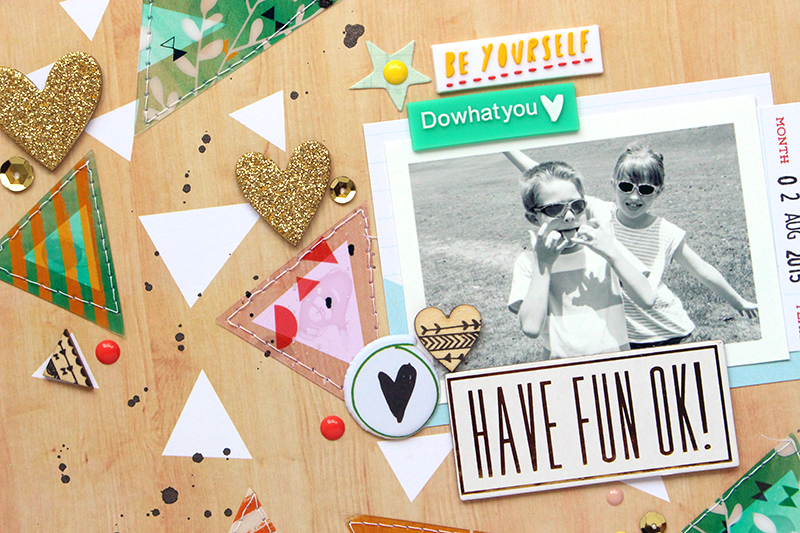 It's time to share a new layout for Hip Kit Club, using the August 2015 Hip Kit & Add-On Kits! This week I decided to go with the flow...the flow of the awesome Pinkfresh Studio patterned paper from the August Main Kit, that is! I love wood grain and triangles, so put those two things together and it's a match made in heaven! 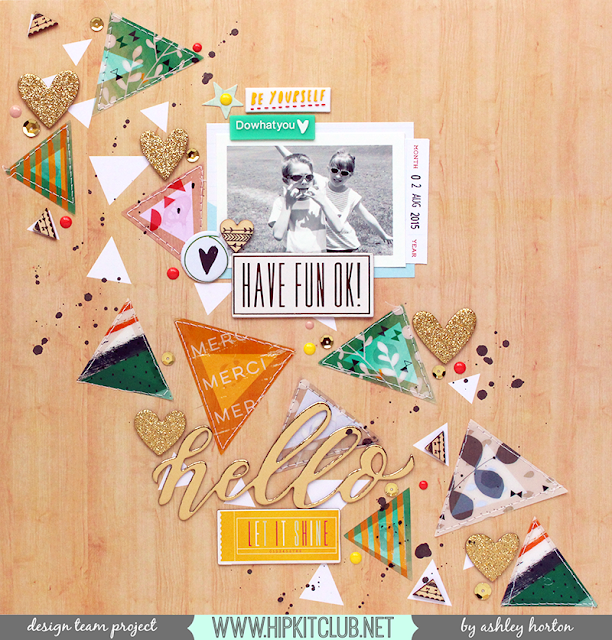 I also wanted to incorporate the fun Pinkfresh Acetate Triangles included in the August 2015 Embellishment Kit, so I layered those over the patterned paper triangles and added machine stitching for texture. I wanted to keep the diagonal design, so I added my photo to overlap the triangle pattern. I clustered a couple of the Pinkfresh Studio embellishments from the August Main Kit and August Embellishment Kit around the photo. And the Dear Lizzy chipboard piece from the Embellishment Kit made a perfect title for my layout. I used a couple of the Project Life cards from the August 2015 Project Life Kit to add a couple of layers behind the photo. Once I had my photo in place, I finished embellishing with some of the Crate Paper Enamel Dots, Freckled Fawn Glitter Hearts and Pinkfresh Studio Wood Veneers. 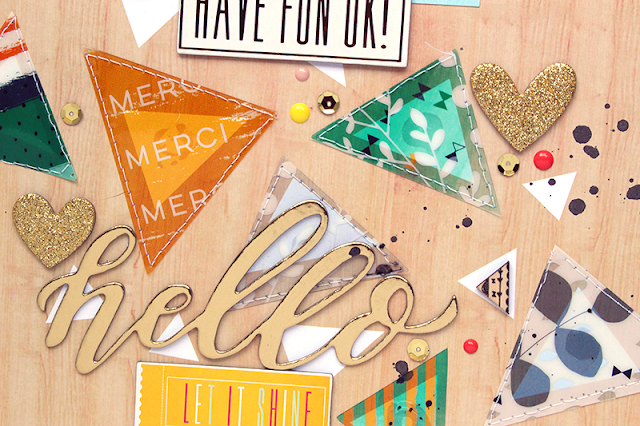 I really liked the way the patterned paper and embellishments came together to create a fun confetti look on the layout. And I couldn't go without a touch of Black Color Shine, so I added some splatters throughout the diagonal design. I've still got a lot of awesome goodies left in my August 2015 Hip Kits, so I might be able to squeeze in another layout to share here on the Blog, before the September 2015 Hip Kit & Add-On Kits arrive! But once I have that new box in my hands, I can't make any promises! I know I'll dig into those new goodies right away! !